– Hardly slept a wink because the sun barely sets this time of year! Turns out we are excited to be on the trail again! 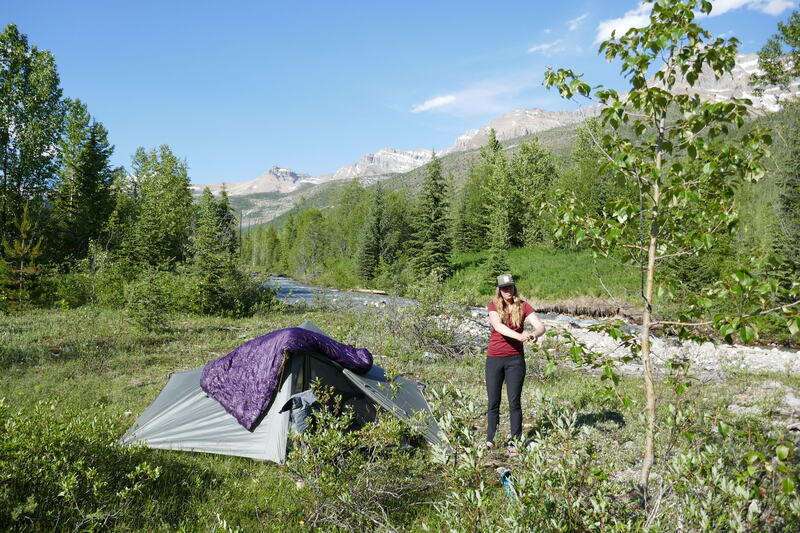 After all the comforts and conveniences of “city life” (although I’m not sure I would call Banff or Whitehorse cities), I was apprehensive to get back to roughing it. But we feel so at home out here…so full. We leave Tic Tac the van in his previous trailhead spot. There’s an obvious pep in our step, from a long rest for both our bodies and our souls. 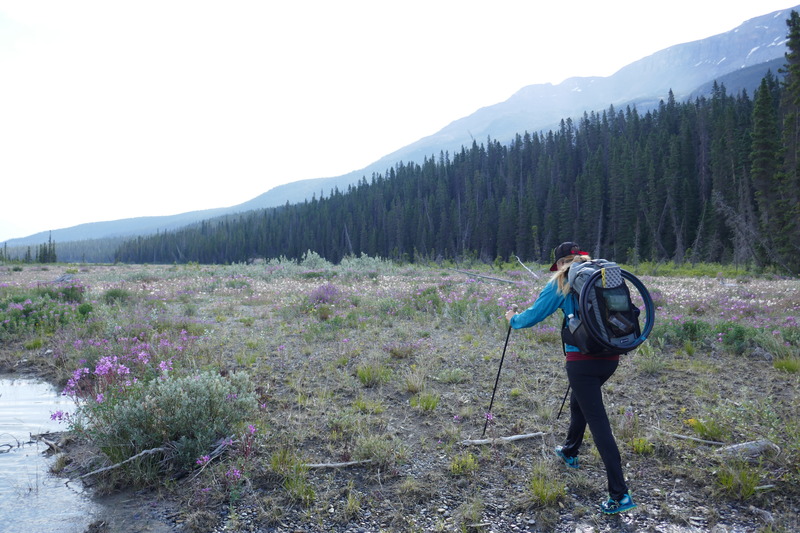 I’m also super stoked to be leaving our snowshoes behind, and replacing them with my hula hoop – not nearly as practical, but WAY more fun! The trail begins with an easy old road walk. We’re cruising along, fuelled by reminiscent conversation about our wonderful time in Whitehorse. Family is the best! 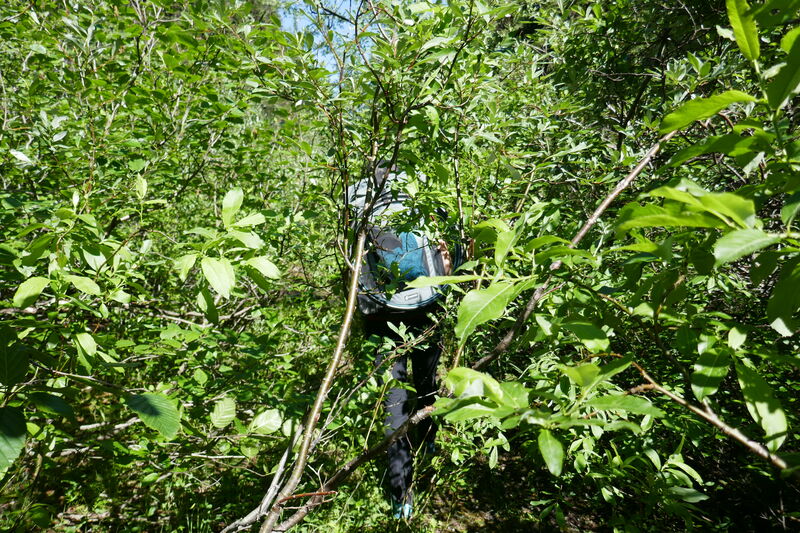 Like good little hikers, we read the trail report of this upcoming section, so it’s no surprise when the trail gets a little brushy with bending over alders and willows. It’s not too awful early on, so we continue to make good time. It’s really hot…and we love it. We “swim” (more like dip) in the frigid Amiskwi river at lunchtime to rid us of our sweat, salt and dirt. I forgot how wonderful swimming feels on a hot day. So this is summer…what bliss! Lorax wakes me later than usual due to some heavy protest on my part, but eventually I rise to the usual aroma of coffee. I poke my fox head out of the den to see there is not a cloud in the sky! 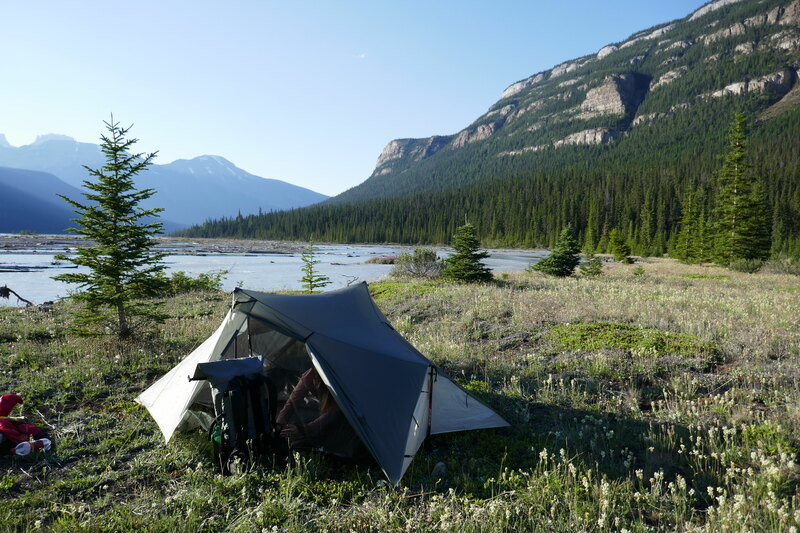 We are in for another sunshiny day on the Great Divide Trail. We wave audios to our beautiful riverside camp. We get a mild ascent over with first thing before the blazing sun hits. We have a chilly river ford, but no big deal, it will be a scorcher later! As usual, the flowers are unreal, and since they are in abundance, I decide to pick a yellow columbine and attach it to my pack for good luck and some flower power energy. The trail got brushy again, but we managed to skirt around a lot of it. 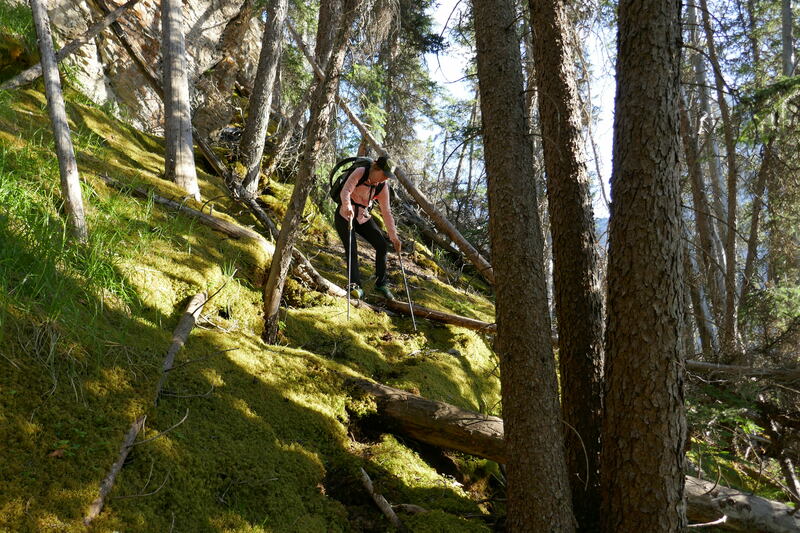 We eventually reach an old logging road that will be our trail for the next 25 kilometres. We walk very fast, breathing heavy and sweating in the heat. Sometime close to lunch we pass the 600km point, but forget to make a marker (again, as we missed 300 and 500 as well)! Not very good trail breakers I’m afraid. We motor along the road, and my old nemesis foot pain has returned (right Achilles’ tendon), so my pace slows to a moderate hobble. By way of distraction, I pop my headphones in and listen to several podcasts, including “Missing Richard Simmons,” which has me laughing out loud. I lost my yellow columbine flower somewhere, so I replace it with a daisy…maybe the official flower power symbol will be more effective at fueling me? Oh, and it’s time for afternoon coffee!! Saved. By. The. Buzz. 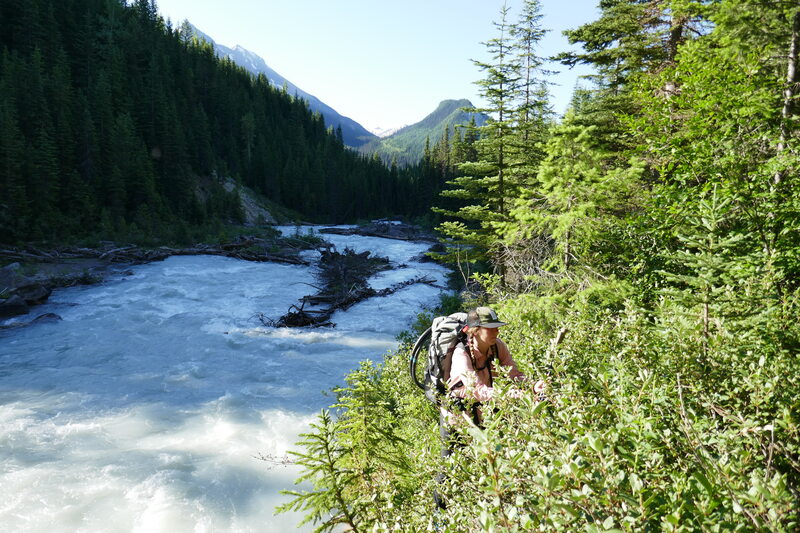 We boil coffee water beside Blaeberry River, which is fast moving, glacial, and silty, but oh so refreshing! 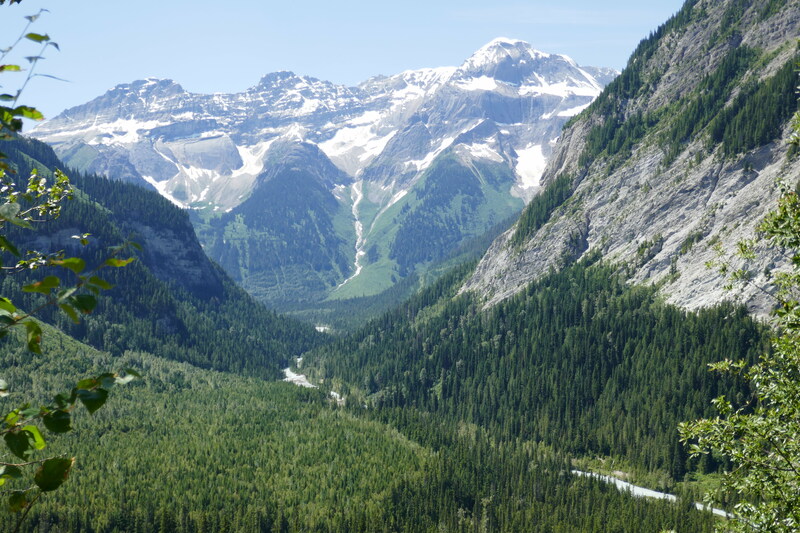 We jump in, and soak all our clothes we’re hiking in and put them back on – backcountry air conditioning at its finest! 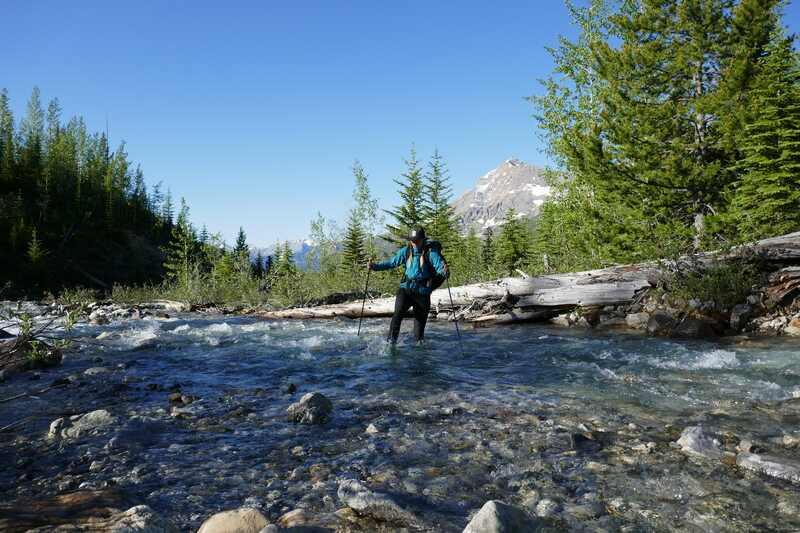 We camp a mere 7 km later along Blaeberry River, being as 30 km was our goal, and my hobble is slowing. I’m not sure what we’re going to do about it. My shoes seem to apply pressure on my achilles, and as my feet get worked and hot and swollen throughout the day, the pressure gets more painful. I think my right foot must be a little longer than my left, since the left doesn’t seem to hurt as often. We might decide to cut some of the heel off my shoe, but that scares me since I’m hoping to get another 1000 km out of them! Yikes. We inhale our “Mexican Night” dinner – fajitas with black beans, salsa, peppers and avocado with tortilla chips on the side. It’s our favourite dinner out here, and the only one that isn’t pasta. Dan suggests that we play Mexican music next time, and we joke that the closest thing I have to Mexican music is “Ring of Fire” by Jonny Cash. But that could work…? Just I case you haven’t gathered this yet by my MORE THAN honest blogging style, this trip has not been your typical vacation – it is not a walk in the park; not a stroll in the woods. And today the GDT really wanted to drive that point home. 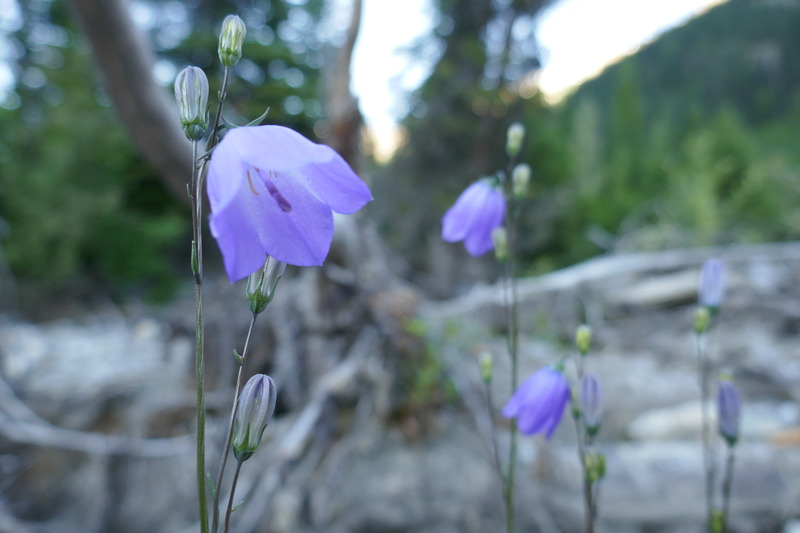 It’s been sunny, and hot, and gorgeous, and everything you want in a summer backpacking trip…at least lately (f/b to the first day of summer when we were battling falling snow). Back to today. We read the trail guide, refer to the GDT app that we have on our iPad, and even study the hiker notes section where people share tips and warn against falling into their own follies. So we knew Section D was brushy and rough in a “where the h is the trail” sort of way. My favourite hiker comment on today’s mileage was, “the trail is hit or miss; mostly miss.” MY GOSH they weren’t kidding. 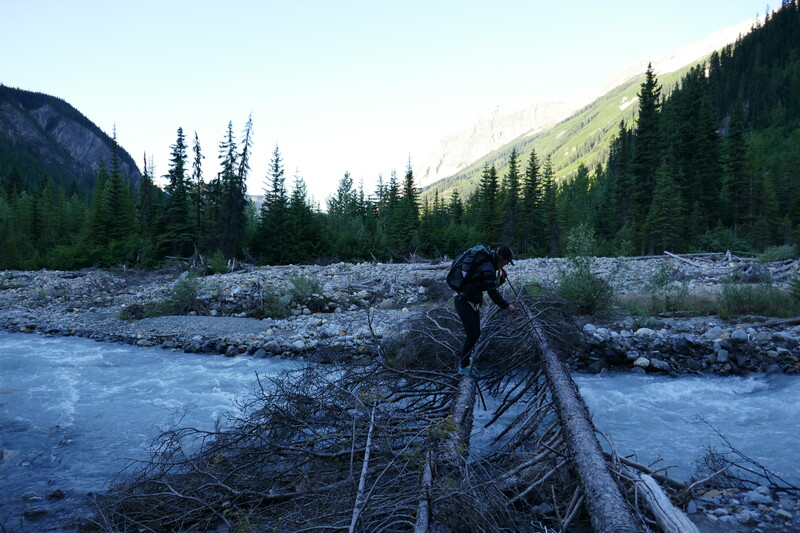 The morning starts with a rather sketchy river crossing of Cairnes Creek, that we luckily found some trees across that we could utilize as a make-shift bridge. Dan waltzed across like it was no big deal (because his trail name SHOULD be No-Big-Deal, I mean NOTHING phases that guy), but I was another story. If Dan is No-Big-Deal, than I’m more like The-Sky-Is-Falling. I literally inched my way along those trees (or more like centimetered), certain that I would fall to my watery, frigid demise. I didn’t, because it was no big deal – Dan, you win. 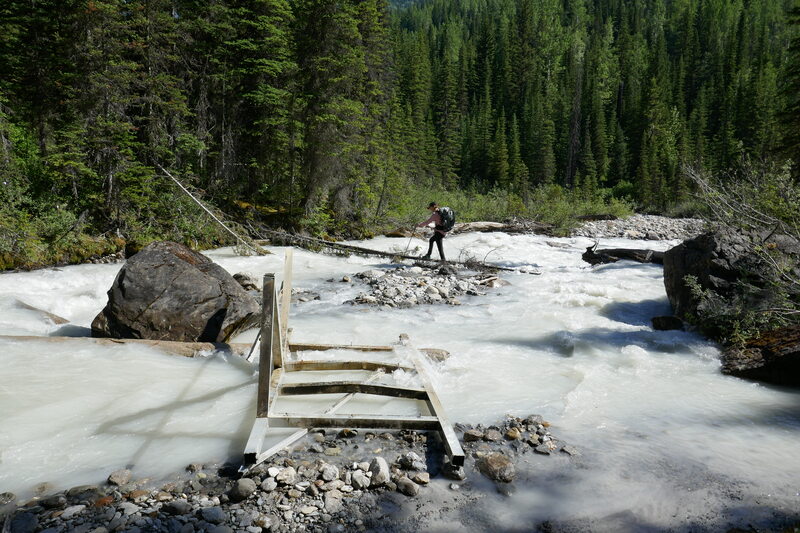 (Side note: I did fall in during a crossing later in the day of Lambe Creek. It was a smaller flow, but scary nonetheless). So the trail. WHAT TRAIL? 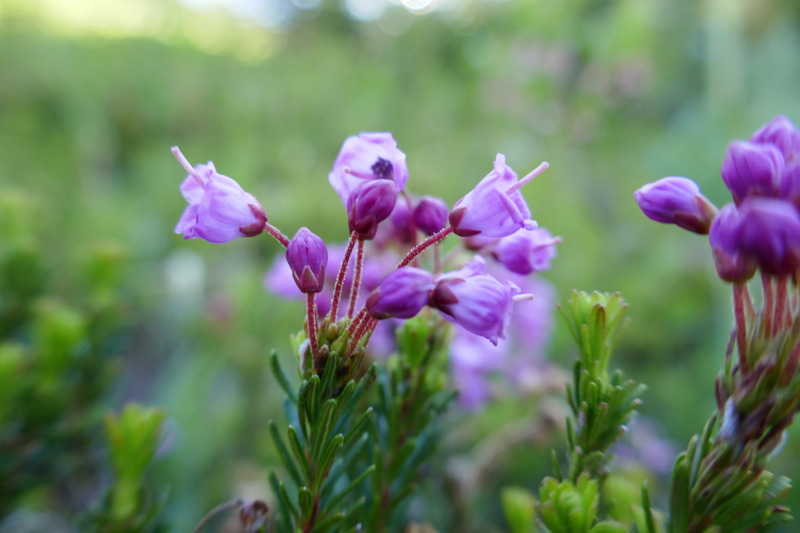 We begin along the David Thompson Heritage Trail, which follows the Blaeberry River – more like gets swallowed by the Blaeberry. Turns out the start of the trail is far too close to the water, and if it hasn’t eroded into the river by now, it is likely flooded right now due to the high water levels. To add to the discomfort, enter the overgrown willows and various brambles. If we weren’t swimming through frigid water, we were climbing through needles and leaves and thorns and twigs and soggy mossy ground. It was rough and tiring and cold. Luckily it didn’t last long (as nothing lasts forever! ), and our journey up the rest of Howse Pass was much more comfortable. It was still brushy, because Brushy is Section D’s real name, but manageable. But the descent. Enter hiker comment on the trail being “mostly a miss”. I have NEVER bush whacked this hard in my entire life! 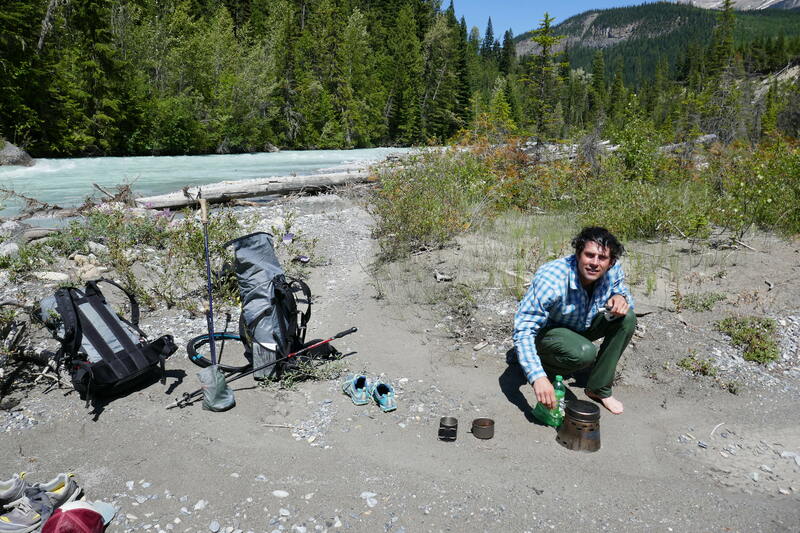 Dan has, but he’s a professional off-trailer (“It was easy, didn’t even rip a hole in my pack” – Dan). Apparently the park hasn’t maintained it for 23 years and it shows. Trees down everywhere, overgrown from all angles, and to add to the experience, buzzing flies everywhere. Apparently horseflies are not repelled by DEET, so I had to wear full clothing from head to toe as repellent and it was hot. Sweat factory! Since Dan is the man when it comes to navigation, he ended up skirting us off the trail where we followed the Howse River flats. It was still slow going as we had to cross the river braids all day in a twisty turny way, but we were away from the downed trees. And the views! 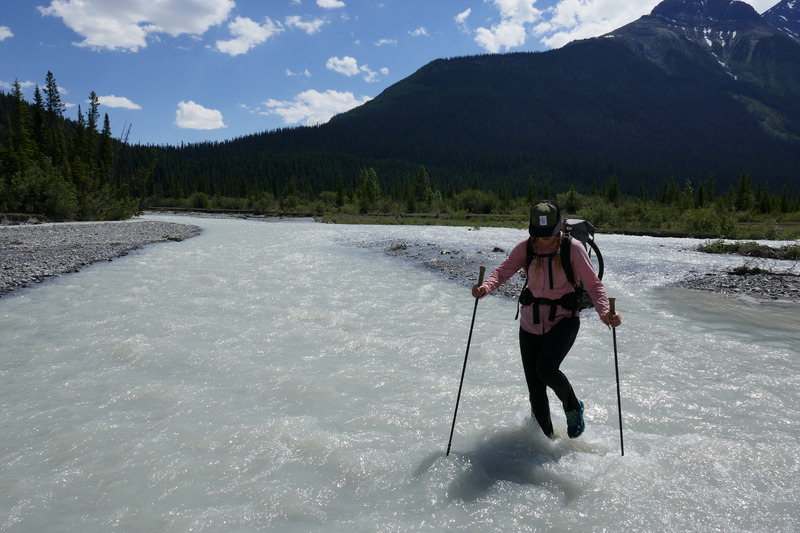 My gosh, walking along a river flat that is surrounded by mountains on a hot summer day, jumping in and out of the river…can’t be beat. 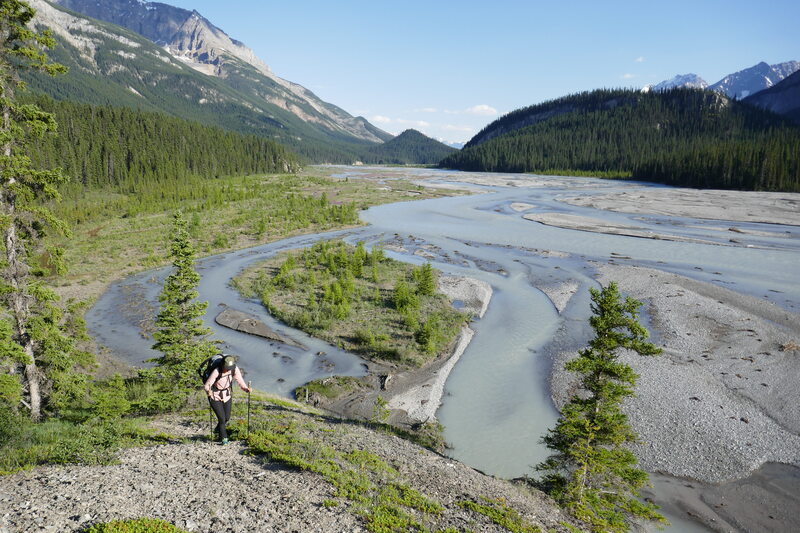 Unfortunately we had to return to the trail once in a while due to cliffs, and it was a wonderful reminder why the wide open river valley ROCKED. 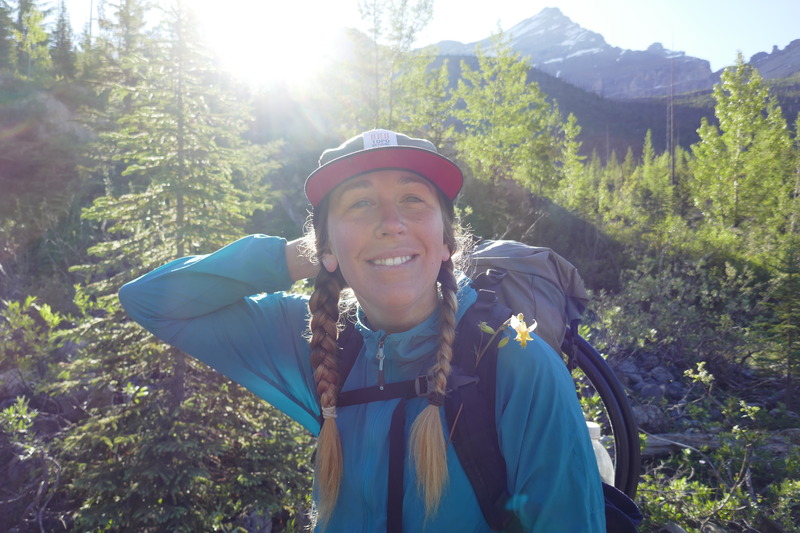 Banff Park is awesome, and I know they have a lot of trails to maintain, but I hope this one gets back on their radar soon! Our afternoon coffee break included a much needed swim and clothes rinse in the river, and we felt a lot better. However, the constant river crossings and cliff skirting and tree hopping got the best of me ( you don’t say!) and I was done. We hiked from 7:00am-7:00pm for a measly 22 km. Dan set up the tent while my sanity battled the horseflies, and we crawled into our home. I had a minor panic attack in the tent because I do that from time to time (this can get so overwhelming!) and we cuddled up together. Dan assured me that we didn’t have too much impassible trail left, and I slept easier. We both slept soundly, but I woke with my anxiety still balled up in my stomach. I knew we weren’t done with this mess yet, and it was hard to be bright-eyed-and-bushy-tailed, despite the coffee. But the hike must go on, so hike we did. Five minutes into hiking, yet again, we needed to cross the river. The time is 7:05am, and the last thing our feet and legs wanted was a freezing bath! Oh well. I cried my way through it, and at least 3 more back to back crossings. I’m numb, I can’t feel my feet, and my shoes are full of sand. I know, I’ve been such a Negative-Nancy this section, but these struggles are real, raw, uncomfortable and frequent. 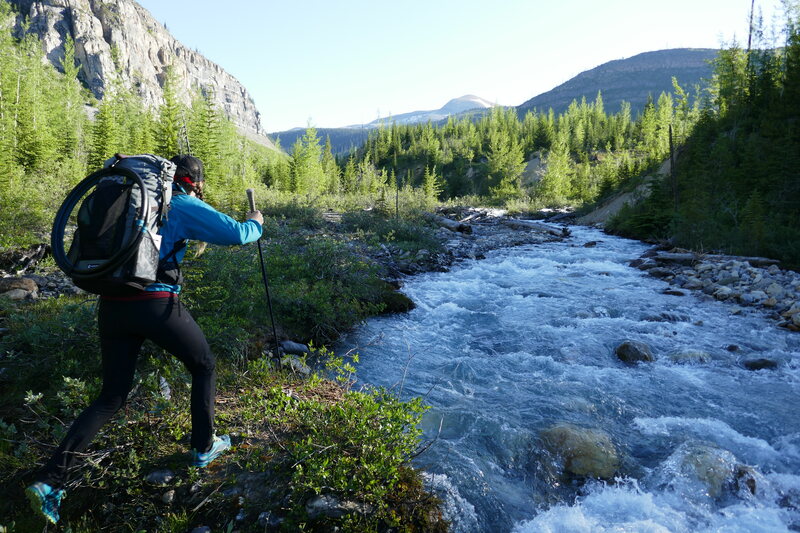 We end up with another day of back and forth between the trail and the river flats, but it’s not nearly as bad as yesterday. We can do this. 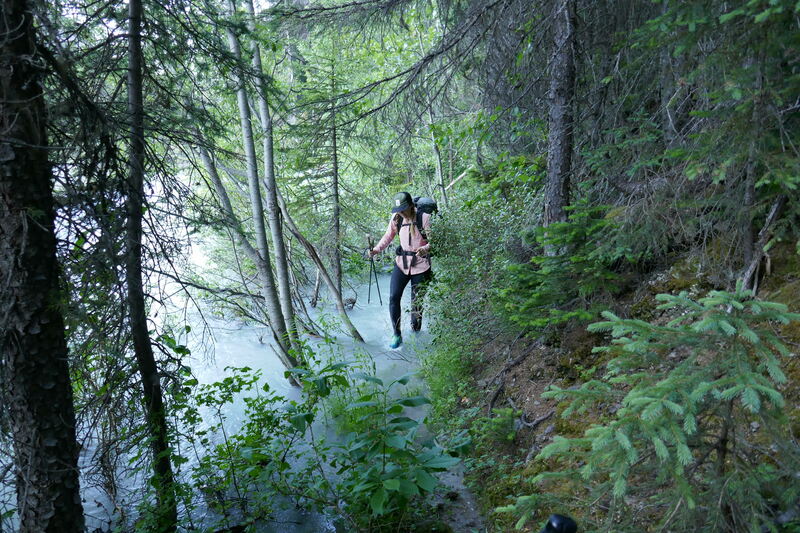 Just think of all the other thru-hikers who have worked their way through this very same, difficult trail. Today the trail is surrounded by marshy bogs, and the mosquitos are insane! We hate DEET, but today I love the chemical invention. 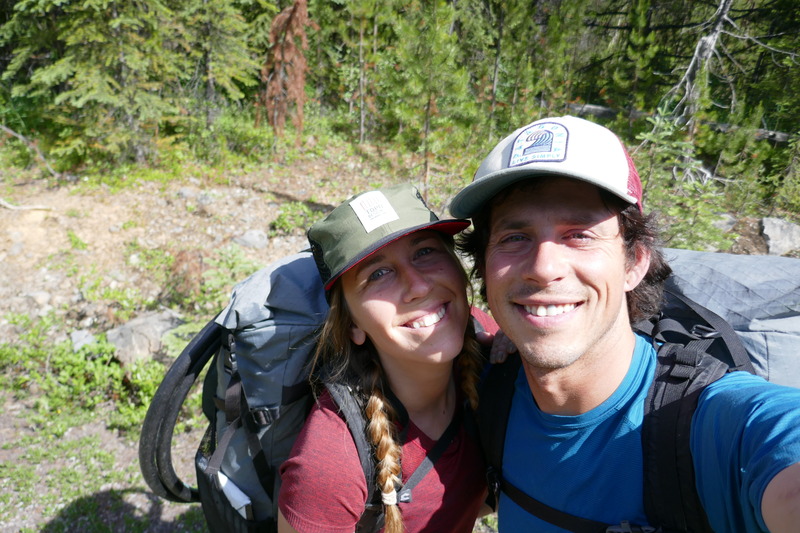 We both hike in stuffy, full coverage clothing, and apply DEET to any and all exposed skin. The persistent buggers continue to swarm us with their lazy sounding buzzes, but thankfully don’t land on our skin. Just shy of our resupply stop at Saskatchewan Crossing, we (obviously) decide to take a dip in the North Saskatchewan River. I have never felt so relieved and refreshed and recharged! The cold but slow moving water (as we were swimming in a side branch) was perfect. This may have been the first swim where we actually stayed in the water longer than we had to. We walked the final 1.5kms to “town” with our heads held high. Another section in the books. Never mind that I have to hike it again southbound on our yo-yo…that’s a worry for another time. I’ve said it before, and I’ll say it again … you are a great writer, Tara!! Some of those wild places in your photos make me wish I lived there. All my life I’ve wanted to live in a cabin in the wilderness but my mission has taken priority. I comfort myself with the possibility that in eternity I will have an entire galaxy of amazing wilderness planets to enjoy forever. In the meantime, keep those beautiful photos coming. I’ve heard there are a lot of forest fires in BC. Stay safe and we are praying for you two.